Plot: When Kingpin opens up a portal to alternate dimensions, a multi-verse of Spider-Men, women, and...err...pigs...must deal with the problem. Director(s): Bob Persichetti, Peter Ramsey. Cast: Nicholas Cage (voice), Liev Schreiber (voice), Hailee Steinfeld (voice), John Mulaney (voice), Jake Johnson (voice), Lily Tomlin (voice), Shameik Moore (voice). Go see. Be amazed. Then go see again. Given the sheer volume of superhero movies sloshing around at the moment you may be tempted to give Spider-Man: Into the Spider-Verse a miss. What’s one more film, about one more guy in tights, after all? Don’t! 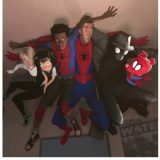 Into the Spider-Verse isn’t just the best superhero movie since Deadpool shook us out of our collective super-torpor, but probably the most visually daring film in decades. Fresh, funny, with lots of knowing nods to the Spider-Man legacy, Spider-Verse gives us not one but five comic-book Spider-Peeps, including Spider-Pig. Yup, you read that right. Just run with it. Embracing the craziness that comes with a brand that’s spanned 55 years and hundreds of incarnations, Spider-Verse never lets up the pace. Blink and you’ll miss something special. Yet there’s more going on here than frenetic action sequences. Spider-Man’s popularity has always hinged on the fact that, of all the Marvel supers, he’s the most most down-to-earth, the most relatable, and Morales’ tale has all the heart and wisecracking you’d expect from your friendly neighbourhood mutant. What makes Into the Spider-Verse the out-and-out movie hit of the year is its staggering visuals. Like a comic book come to life, the whole film is a glorious tribute to CYMK printing right down to the Ben-Day dots. Occasionally the out-of-register effects are a little too much—like watching a 3D film without the glasses—but boy what a ride.